For VW 85 86 87 88 89 90 91 92 GOLF MK2 8V 2.0L Bolt On TURBO Charger KIT. THIS TURBO KIT DOES NOT INCLUDE THE DOWNPIPE, BUT YOU CAN USE THE 2.5 V-BAND TO CONNECT ONE PIPE, AND MAKE THE DOWNPIPE BY YOURSELF, THAT IS EASY STEP. All PARTS ARE BRAND NEW IN BOX. WILL GIVE YOUR CAR 20%-50% HP. SUPPOSE GAIN 100-150HP, CAN UP TO MAX 350 HP FOR THIS KIT. ALL THE PARTS ARE IN THE PICTURE, INCLUDING THE HARDWARES FOR INSTALLING, NO INSTALLATION IS INCLUDED. PROFESSIONAL INSTALLATION IS HIGHLY RECOMMENDED. V-BAND T3/T4 INTERNAL WASTEGATE TURBO CHARGER. Outlet Diameter, Compressor : 50 AR, Exducer : 3? Turbine : 63 AR , Exducer: 2.2? 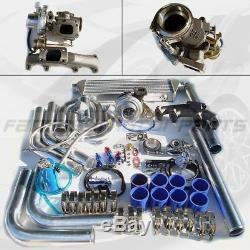 Come With Internal Wastegate Set At 8 PSI, Max Up To 35 PSI Power Performance Output. CNC Machined Flanges, T3/T4 Flange, 2.5V-Band Downpipe Flange, Max Power: 350HP - 400HP. 2.5 STAINLESS STEEL V-BAND CLAMP. For Two V-band Flanges Connect Without Welding Or Bolts, Locking Nut Will Prevent Back Out, Help You To DIY Making The Downpipe Easily. VW 8V CAST IRON TURBO MANIFOLD. BLACK CAST IRON TURBO MANIFOLD, HIGHER RESISTANCE TO HEAT, DIRECT BOLT ON TO YOUR ENGINE. ALLOW POWER STEERING AND AIR CONDITIONING, FITS WITH T3/T4 FLANGE INTERNAL WASTEGATE TURBOS. WITH 2.5 INCH INLET/OUTLET. LOW PRESSURE DROP - LARGE COOLING AREA - EASY INSTALL - TUBE AND FIN STYLE. 2.5 inch Diameter Piping Kit With High Quality Silicone Couplers And T-Bolt Clamps. The Couplers Will Not Split Easily + The Clamps Will Not Strip Like The Cheap Kind. Strong & Tighter Fitting Use Hair Spray Between The Pipe And Coupler. Mandrel Bend 2.5 Pipe(As Shown As Picture) For High Flow And High Horse Power And Better Turbo Response Power. Some Cutting And Modification Required! Allows Adjustable Boost PSI Settings, Light Weight Design To Be Mount Under The Hood. Manually Control turbo boost up to 30 PSI. THE RETURN LINE IS 17 INCH LENGTHM, INSIDE DIAMETER IS 0.5 INCH. HELPS CIRCULATE OIL FROM THE TURBO TO THE OIL PAN, WORKS ON METAL OIL OANS ONLY. 100% Brand New, High Quality, Never Been Used Or Installed! The Oil Feeding Flange has Restriction build in, offers proper Oil Feeding to the turbocharger. The Length Is 37 Inch. CNC Billet Aluminum, Dual Stage Handle, High Boost Power, Easy Mount Piping Set Included For Bolt-On. Including Bov Blow Off Value Flange. Fast Fesponse One F or Low And High Boost Pressure. High Quality Polished Made Of Billet 6061 Aluminum, And TIG Welded W/ Billet Aluminum CNC machined. Will Ensure Better Performance And Better Mileage On Your Engine. Mounts Above Your Valve Cover And Ensures Excess Dirt And Oil Does Not Get Inside Your Engine. HIGH QUALITY, LIGHT WEIGHT POLISHED ALUMINUM, INCLUDING THE HARDWARES AND HOSES FOR INSTALLING. VW GOLF 8V 2.0L ENGINE. VW JETTA 8V 2.0L ENGINE. VW PASSAT 8V 2.0L ENGINE. VW CORRADO 8V 2.0L ENGINE. ALL THE CARS RUN WITH VW 8V 2.0L ENGINE. Our business hour is Monday - Friday 9:00 a. All payments without item numbers will not be processed. We are not responsible for carrier transit time. This information is provided by the carrier and excludes weekends and holidays. These charges are the buyers responsibility. We guarantee 100% satisfaction on our products, and top notch customer services. All presumed defective or wrong items must obtain an authorization before returing. Monday to Friday only (excluding Holidays). The item "For VW 85 86 87 88 89 90 91 92 GOLF MK2 8V 2.0L Bolt On TURBO Charger KIT" is in sale since Wednesday, August 23, 2017. This item is in the category "eBay Motors\Parts & Accessories\Car & Truck Parts\Turbos, Nitrous, Superchargers\Turbo Chargers & Parts". The seller is "fantasymotorparts" and is located in Whittier, California. This item can be shipped worldwide.